What is Frontline Spot On? Frontline Spot On is a treatment for both cats and dogs that provides long-lasting protection against fleas and ticks, and controls biting lice. 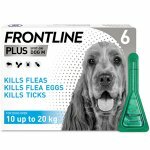 Frontline Spot On contains fipronil, a phenylpyrazole licensed for use as a veterinary medicine. 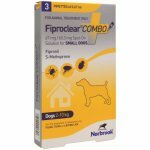 Fipronil is not an organophosphate compound. 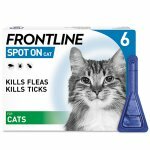 How does Frontline Spot On work? 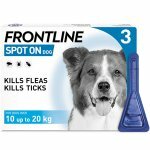 Frontline Spot On acts by direct contact with parasites and not via your pet's bloodstream. 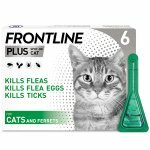 It kills fleas within 24 hours without requiring them to bite your pet. 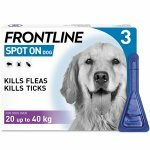 Frontline Spot On is applied externally to your pet's skin on the back of the neck. 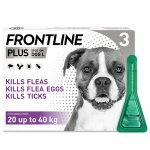 The active ingredient, fipronil, quickly dissolves into the natural oils of your pet's skin and coat, dispersing over the entire body surface within 24 hours and concentrating in the skin's oil glands to form a reservoir. 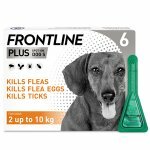 Fipronil is then secreted with the natural oils of the skin and hair, continuously coating your pet's skin and hair for several weeks after application - in fact it's the longest-lasting spot on flea treatment available without prescription. 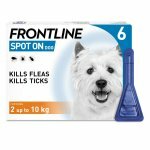 Which Frontline Spot On pack do I need for my pet? Select the correct size pipette for the weight of the animal. It is recommended to weigh the pet. For cats, one at the base of the skull and a second 2-3cm further back is advisable. Animals may be handled as soon as the application site's dry. 1 Hold the pipette upright. Tap the narrow neck of the pipette to ensure the contents are in the main body. Then, break the snap-off top of the pipette along the scored lines. 2 Part the coat between the shoulder blades until the skin is visible. 3 Place the tip of the pipette on the skin and squeeze gently to empty its contents onto the skin, at one or two spots where the animal cannot lick it off. Care should be taken to avoid excessive wetting of the hair with the product since this will cause a sticky appearance at the application site. This will disappear within 24 hours of application.